There are three things Kevin and I love to do when we travel to a new European City: Eat, Drink, and Walk. Fortunately for us, walking 10+ miles sightseeing each day helps to offset the massive amounts of food we eat and all the beer and wine we guzzle down. So that’s good news. I think food is one of the greatest ways to experience a different culture. You don’t have to speak the language to point at something and hold up your fingers to wordlessly ask for two servings. We did our best to get a taste of everything Rome has to offer, from eating flaming pasta flambé to testing out Rome’s burgeoning beer scene. I think we did a pretty decent job for having only three days there. 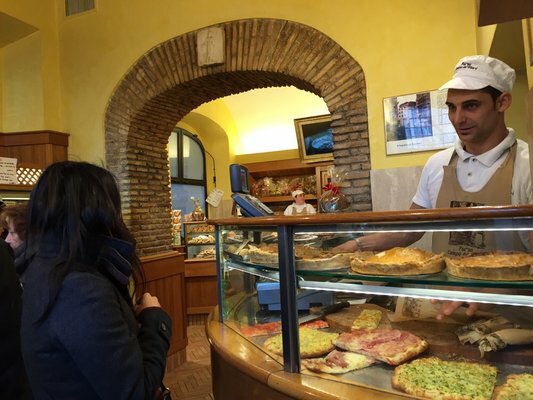 Read on for the things we most enjoyed eating and drinking in Rome! In Italy, the word aperitivo literally means a pre-dinner drink that is meant to stimulate the appetite. 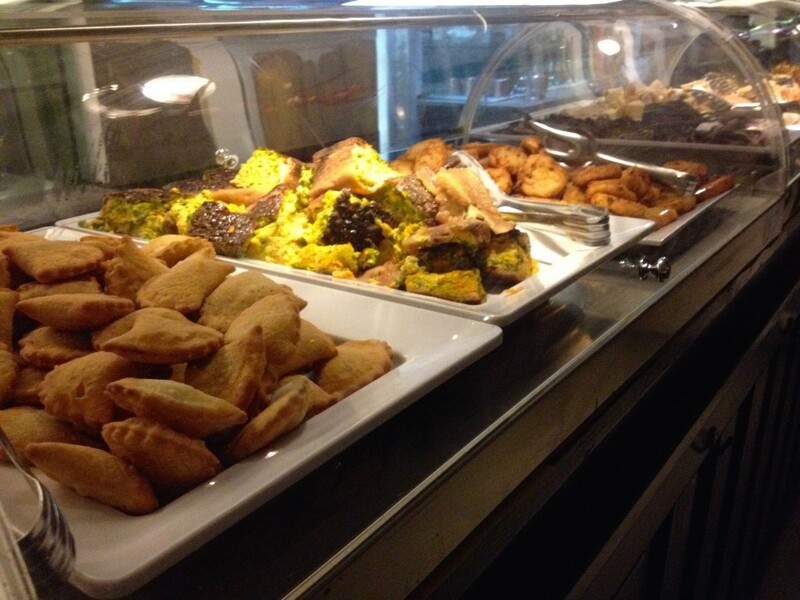 Traditionally, an aperitivo might come with some light snacks like olives or chips. 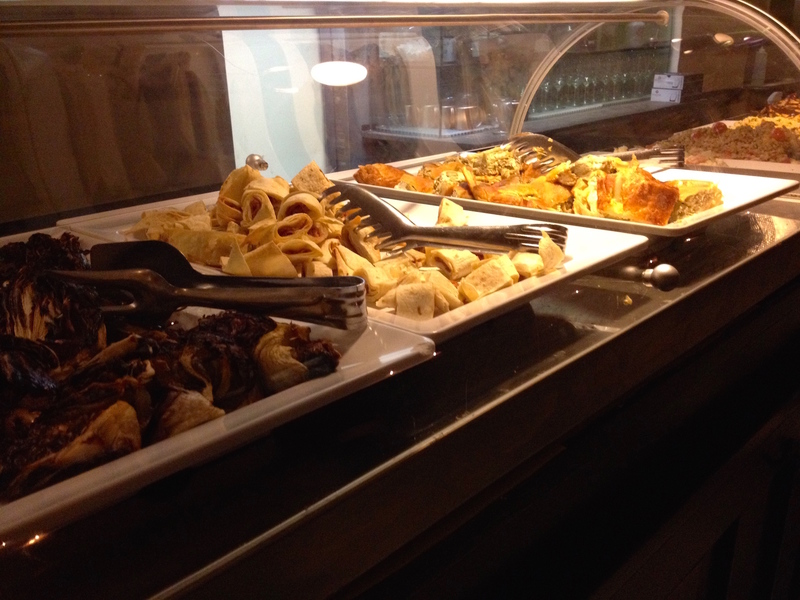 Nowadays, most bars have scaled things WAY up and are offering a full-blown buffet aperitivo. 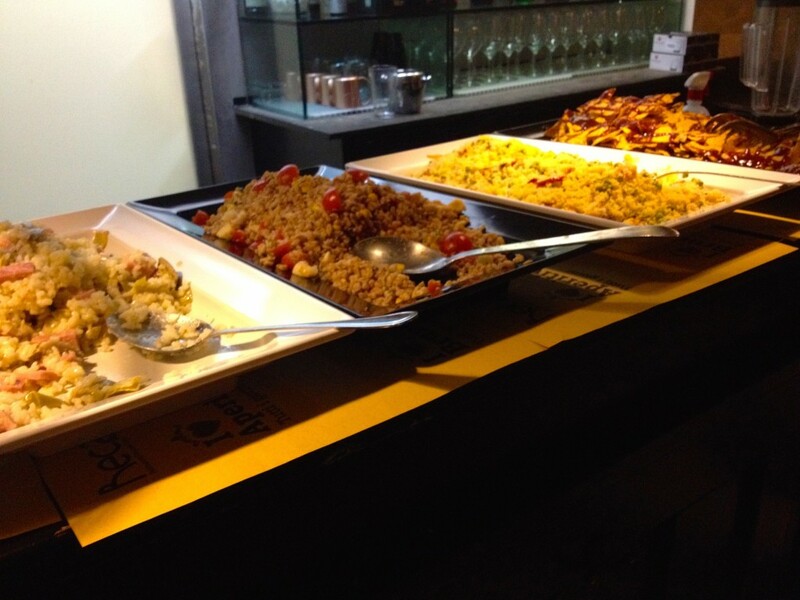 In many Italian bars, you can get an alcoholic drink plus access to their buffet for just 8 to 12 euro! 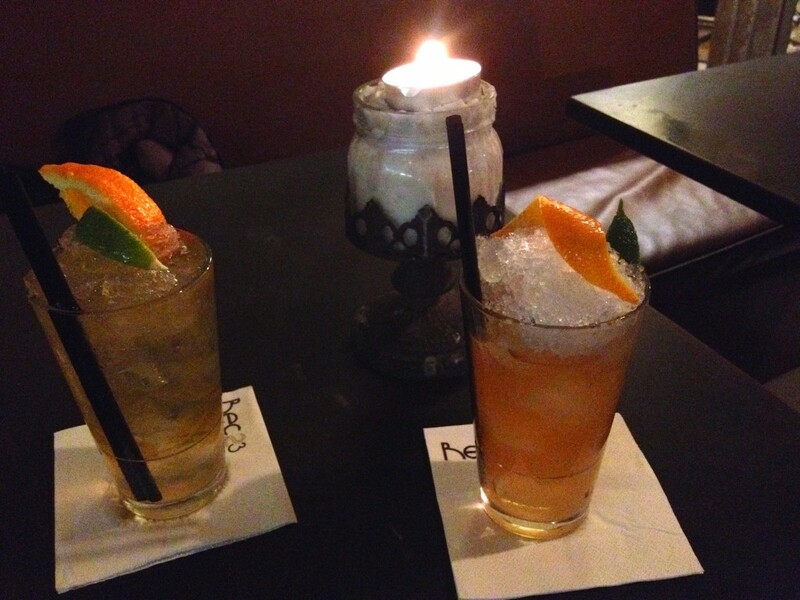 While we didn’t hit up an aperitivo in Florence (they’re everywhere there, too), we did visit two different bars for an aperitivo in Rome. 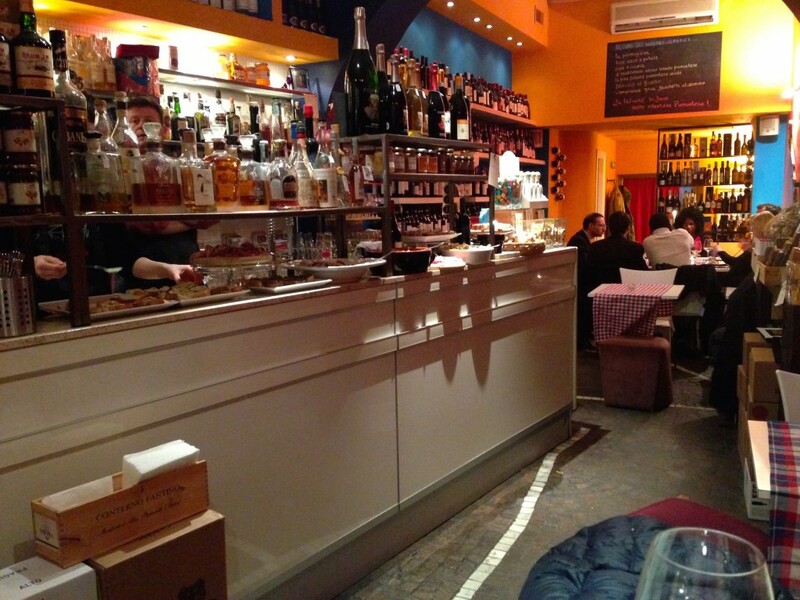 Located in the trendy Testaccio neighborhood, Rec23 was a great first foray into the aperitivo scene. They have an extensive list of cocktails, which is what drew me here in the first place. I wanted to try the Testaccio Mule, which is their take on the Moscow Mule cocktail made with ginger beer that I fell in love with at a speakeasy-style bar in Kansas City a couple years ago. Kevin’s Taxi Driver cocktail and my Testaccio Mule cocktail. Sooooo delicious. The Aperitivo at Rec23 is available daily from 6:30pm to 9pm. Some nights it runs until 10pm. Some nights they have live music! For just 10 Euros, you get a cocktail and unlimited trips to the buffet. The buffet food definitely fell more in the “bar food” category than the “Italian food” category. That was fine with us since we’d been in Italy for almost two weeks, but you might want to look elsewhere if pasta/pizza is on your must list. Fafiuché sits in the Monti neighborhood, not too far from the Roman Forum. 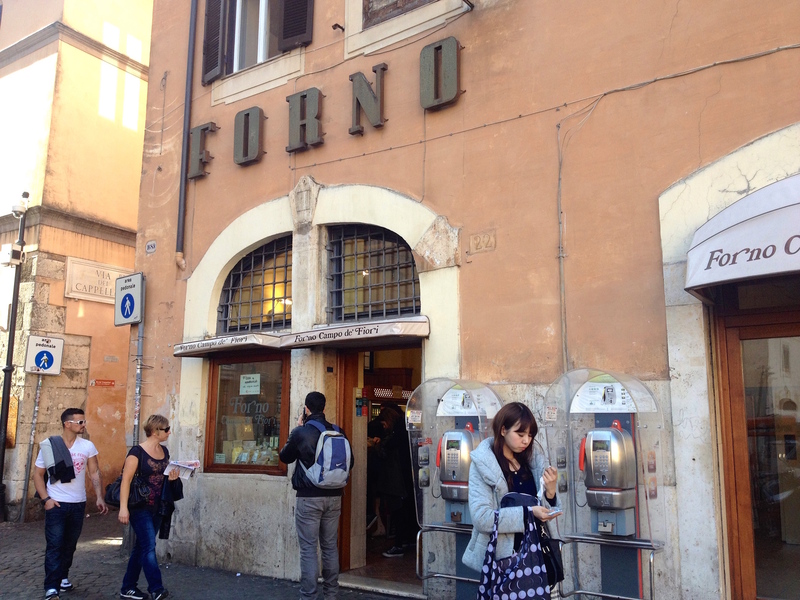 Their Aperitivo that runs daily from about 6:30pm to 9pm is just 8 euro! You pick a glass of wine from their extensive wine menu, then get one trip up to the buffet. The food here was decidedly more Italian than at Rec23 – the buffet had lots of little crostini (toasted breads with various toppings and spreads), cheeses and cured meats, plus a few warm dishes, and even a little cake for dessert. Well, we’ve done it. We found a pasta that all future pastas will be measured against. 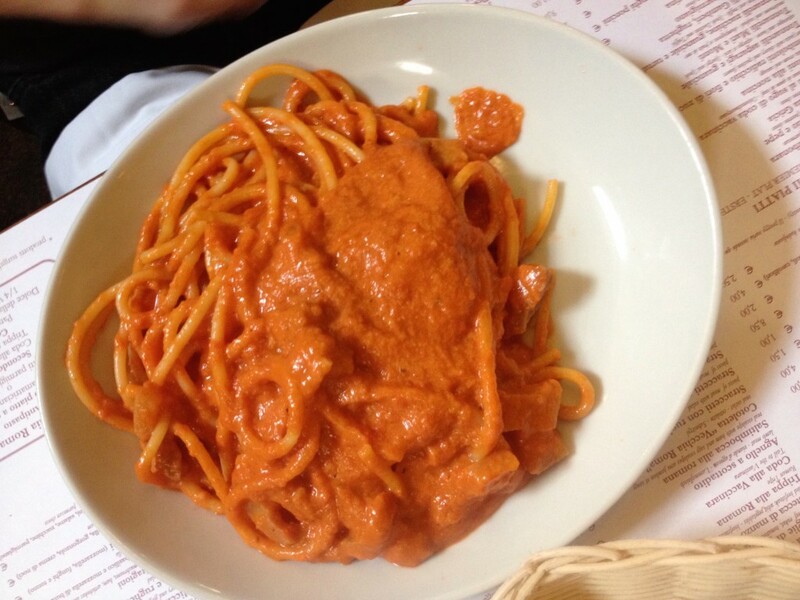 At Trattoria Vecchia Roma, their house specialty Bucatini all’amatriciana Flambé will blow you away. After preparing the pasta, they pour alcohol into a huge pecorino romano bowl, light it on fire (to heat the pecorino bowl up and melt its cheesy innards slightly), then mix the pasta right in the pecorino bowl! It. Is. Amazing. And it was also amazingly delicious. 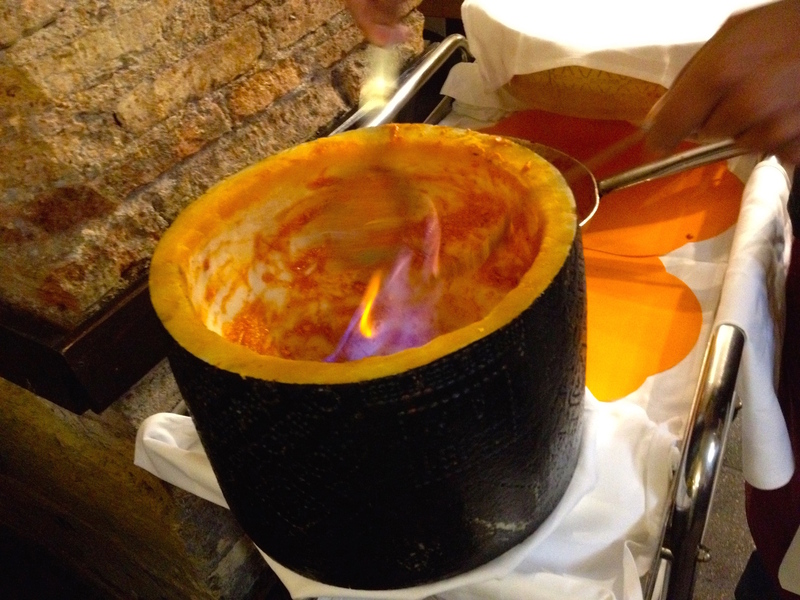 The flaming pecorino romano bowl. The delicious Bucatini all’amatriciana Flambé! 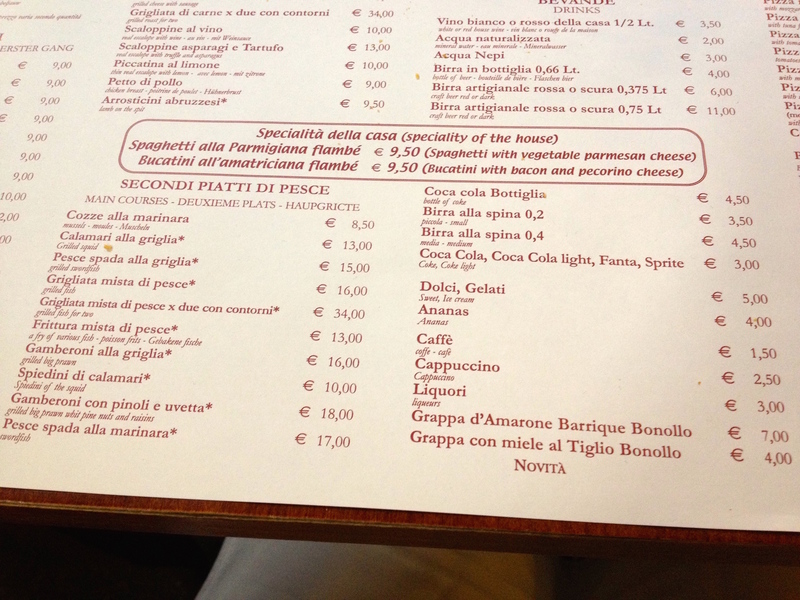 We also ordered Spaghetti alla Carbonara, which was VERY good. The bacon they used still makes an appearance in my food dreams every now and then. 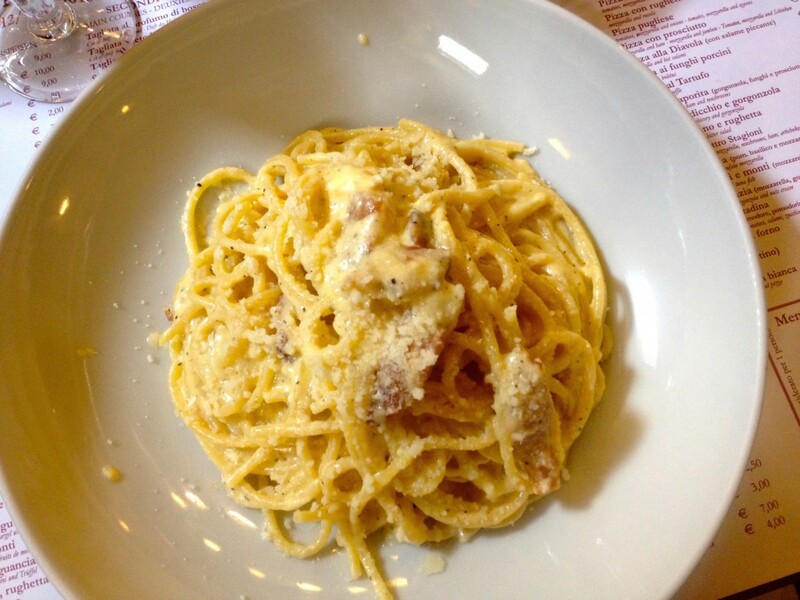 The wonderful Spaghetti alla Carbonara at Trattoria Vecchia. The food was SO good and our server was so friendly that I didn’t mind having to pay for the bread they brought to our table without asking. I usually hate it when restaurants in Italy do that. Maybe the half liter of wine we had with our lunch dulled the pain. 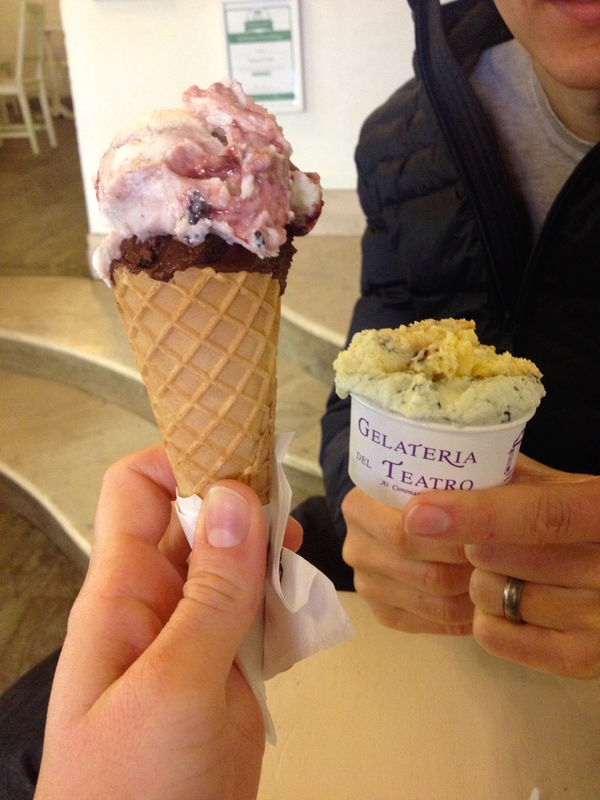 Gelateria del Teatro has great gelato, and they know it. They charge a little extra because it’s so good, but I think it’s totally worth it. Our Gelato: Dark Chocolate and Cheese & Cherry on the left, Mille Feuille and Chocolate Mint on the right. Yum. The cherry and cheese flavor BLEW MY MIND. Admittedly, I am a cheesecake lover – my annual request for my birthday is white chocolate raspberry truffle cheesecake with oreo cookie crust from Cheesecake Factory. (Only 259 days to go until I get it again…) If that cheesecake and vanilla ice cream had a love child, it would be Gelateria del Teatro’s cherry and cheese gelato. I’m salivating at my desk here in Croatia writing this post… We might need to return to Rome solely to get it again. It has been fun to travel through Europe and learn about beer in each country. Kevin does his best to hit all the top-rated beers everywhere we travel, and Rome was no different. One of my friends recommended a bar named Ma Che Siete Venuti A Fa in the Trastevere neighborhood that has a dozen or so microbrews on tap, so we obviously had to go! 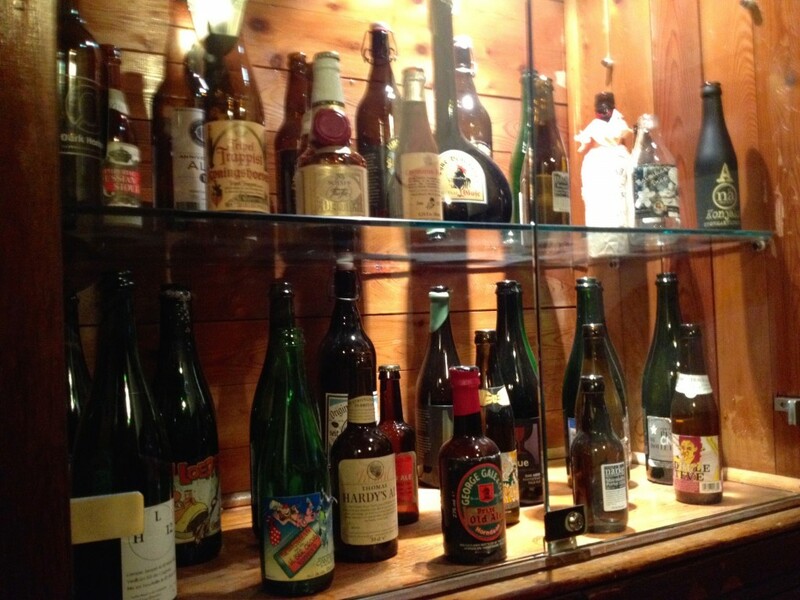 Any bar with a big display case of legendary beers is okay with me. We headed to the bar and were pleasantly surprised at their selection. 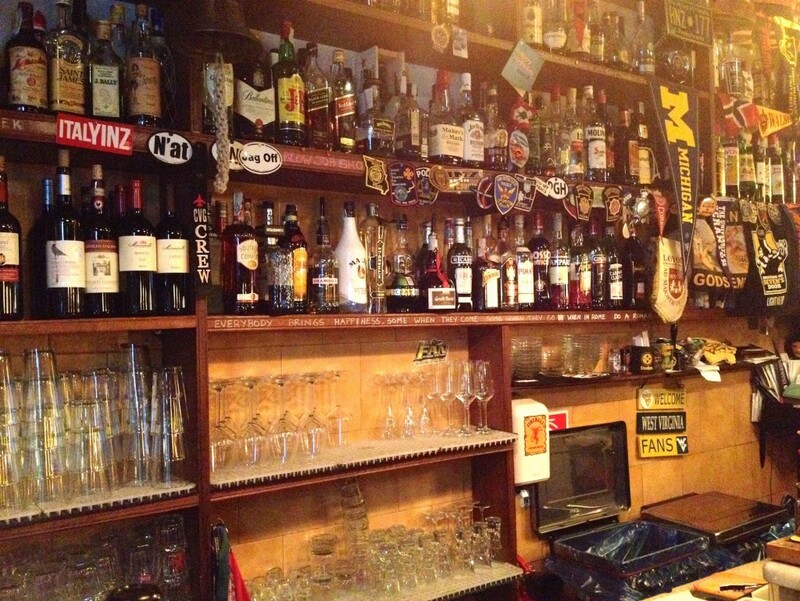 They had quite a few microbrews from Italy, and even had some harder-to-find sour beers from Belgium. For the bargain basement price of 20 euros (I’m joking, to be clear, I do not consider this a bargain), you can get a big bottle of Belgian Cantillon Lambic. We skipped the hefty price tag and went local on our beer choices. 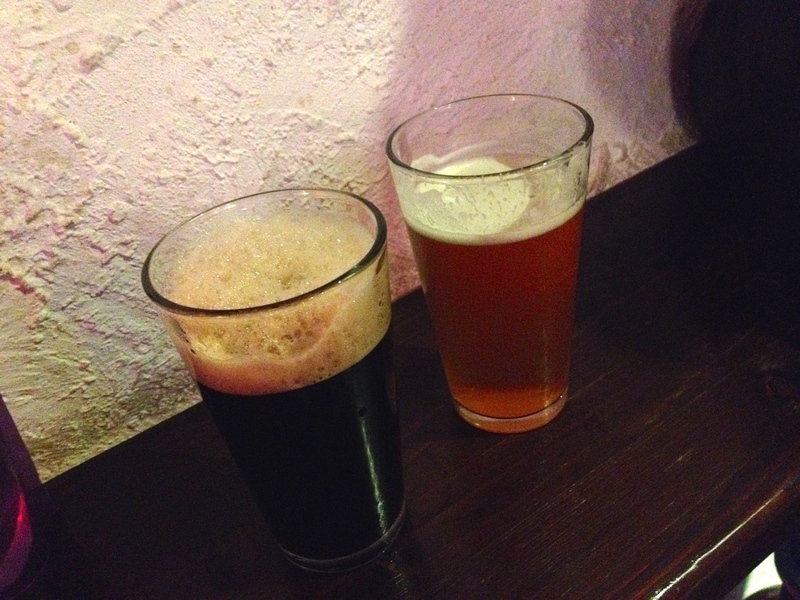 A delicious Menaresta Pan Negar Stout on the left, and a wonderful Lambrate Quarantot Double IPA on the right. Kevin is a happy man when he has an IPA in hand. Look, Rogue beers!! 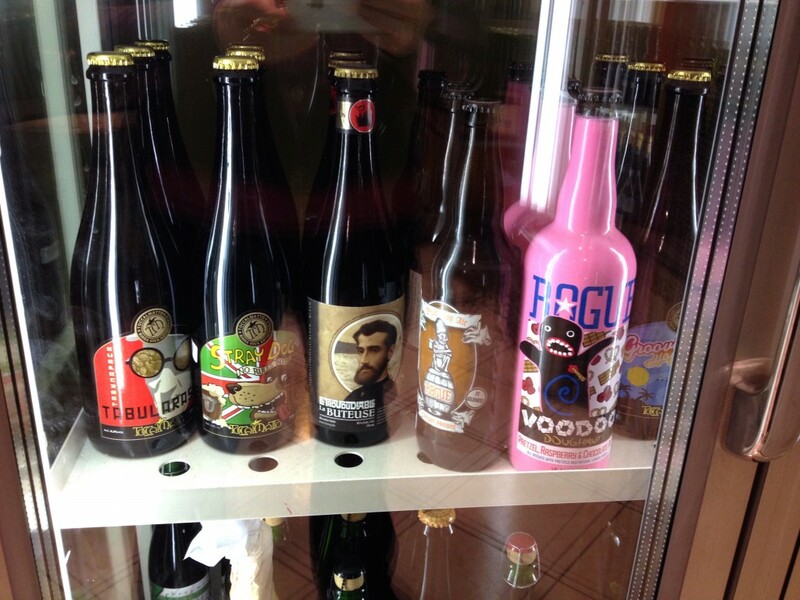 I don’t enjoy the Voodoo Donut beer varieties from Rogue, but I’d recognize that flashy pink bottle anywhere. Westvleteren 12 is widely regarded to be the “best beer in the World”, and is brewed only in small batches by monks at a monastery in Belgium. This beer is notoriously hard to get a hold of because of the rules surrounding sales. It’s supposed to be available only at the brewery in Vleteren, Belgium. Buyers are required to make a reservation ahead of time and show ID because sales are limited to one 24-pack per person every 60 days! In 2013, a limited amount of Westvleteren 12 was shipped to the United States and sold for $100 per 6-pack (crazy, right?!?) to raise money for a new monastery roof. A glass of Westvleteren 12 in Rome. 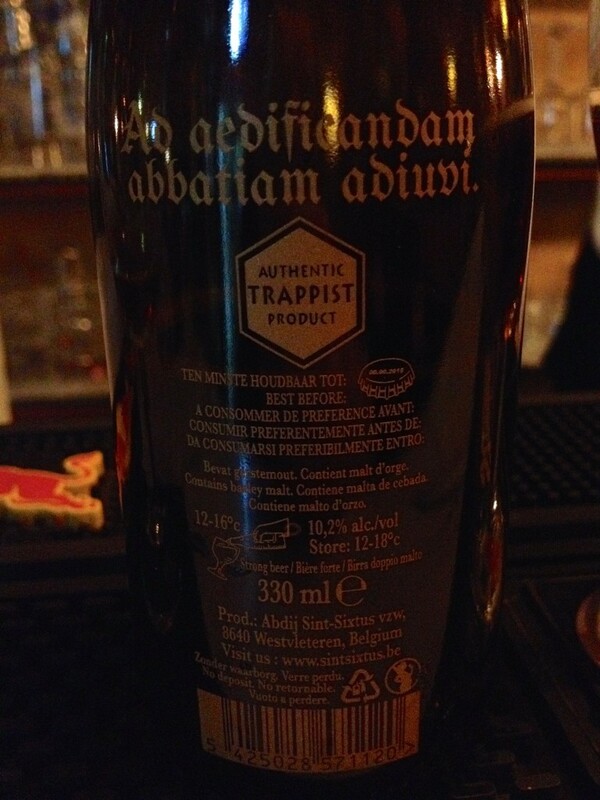 Lucky for us, Kevin did some internet sleuthing and found a bar in Rome selling this rare beer. Technically it was being sold on the black market. (How do we always get ourselves into these situations?) We’ll take what we can get. 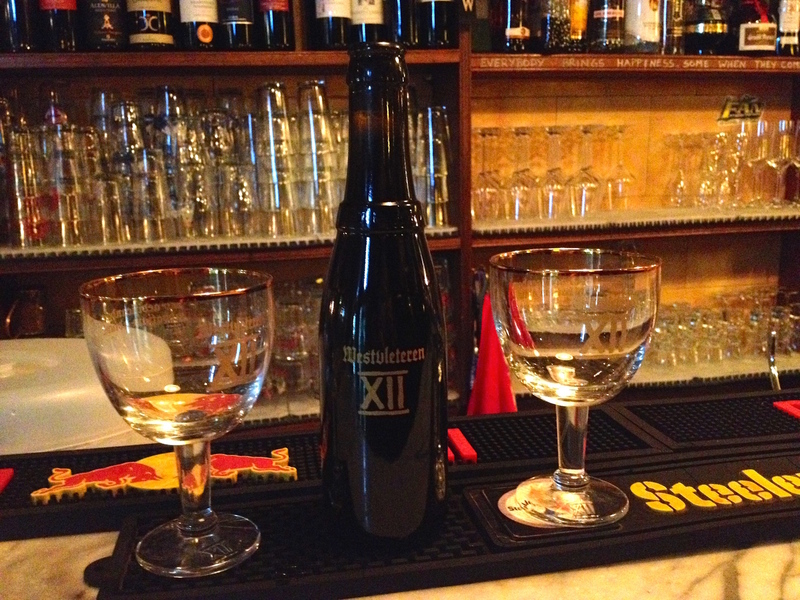 For 15 euro, we got a bottle of Westvleteren 12 at La Boticella in Rome. 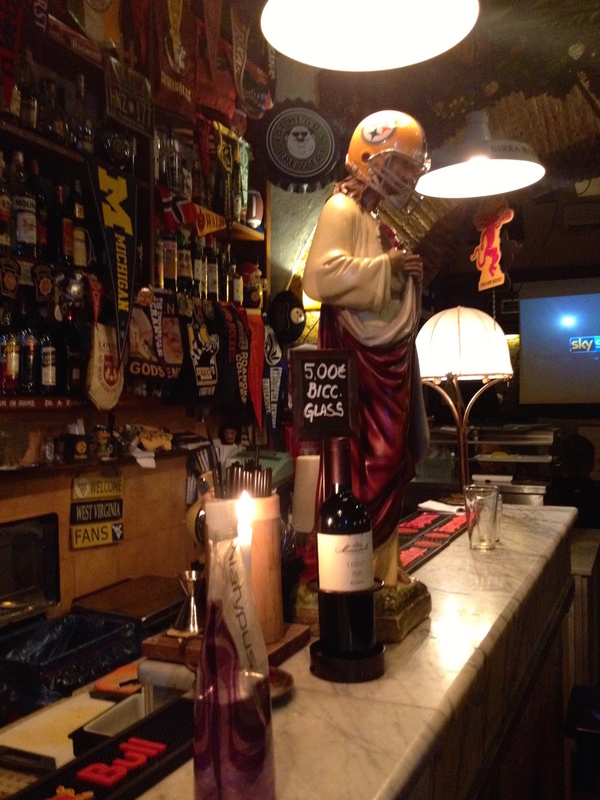 This bar has a Jesus statue wearing a Steelers helmet. So that was fun. 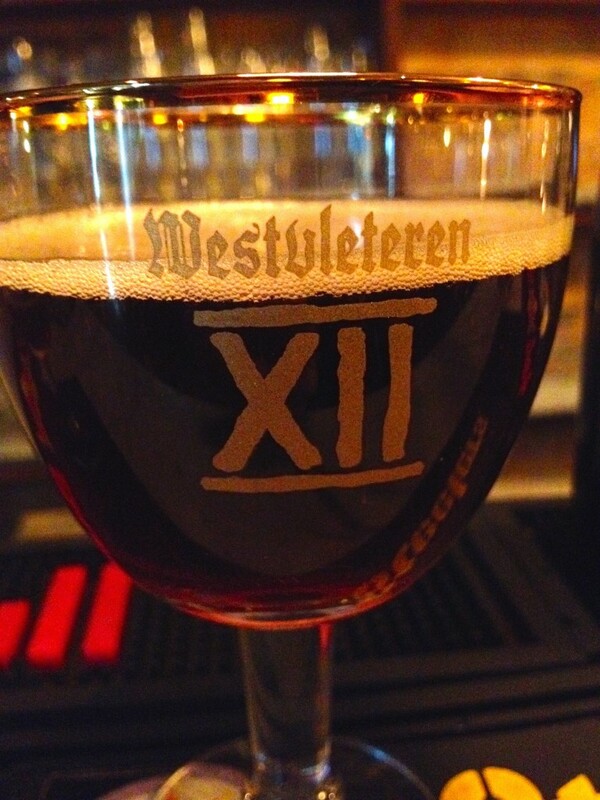 The owner even told us we could have one of the custom Westvleteren chalices to take home for free! We’re planning to give it a place of honor in our home when we’re back in Seattle. La Boticella, a fun bar in Rome. In the end, we decided that this beer is definitely worth trying if you ever see it anywhere in any bar in the world. Is it worth planning a thousands-of-dollars vacation to Belgium for? No, we don’t think so. But if you ever happen to be in Belgium with a car and some free time, you better go get a case or we’ll never speak to you ever again. 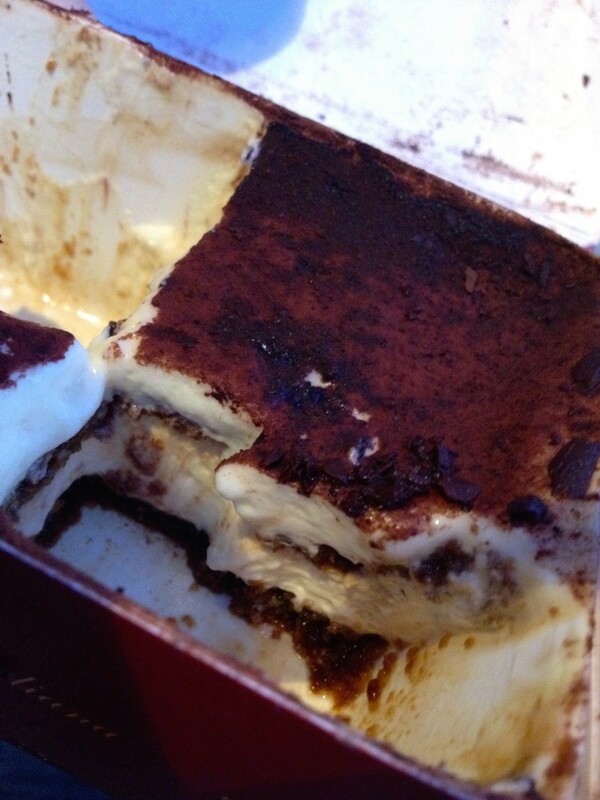 Pompi is the self-proclaimed Tiramisu King of Italy. They have a handful of locations now, which means service feels more industrial-assembly-line than personal, but DAMN they have a tasty Tiramisu. 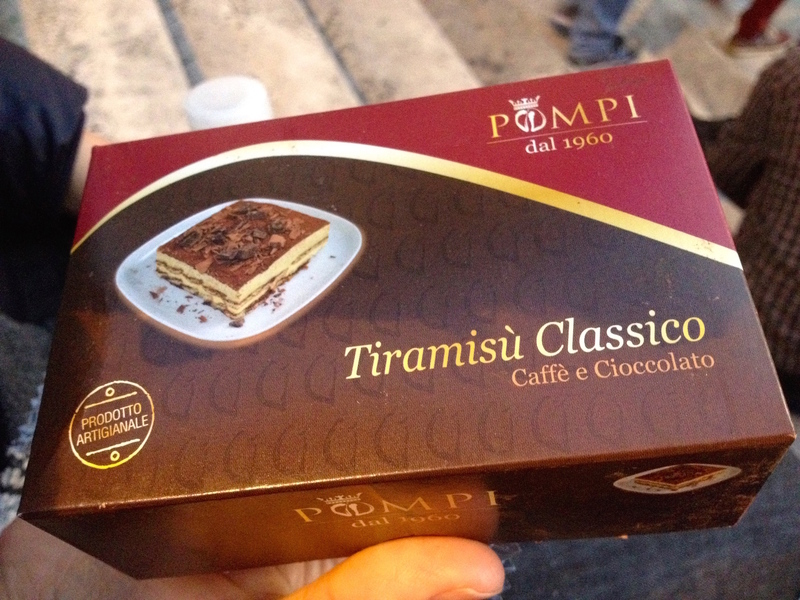 The goods: Pompi’s Classic Tiramisu. Delicious coffee-laced layers of heaven. The lines reportedly can stretch the whole block during high season, but we were the only ones in their store near Plaza di Spagna in February. Tiramisu will cost you 4 euro at Pompi. The selection! Point at anything, show them how much you want, and you pay by the kilo! They also have sweet pastries and other types of breads. You really can’t go wrong here. 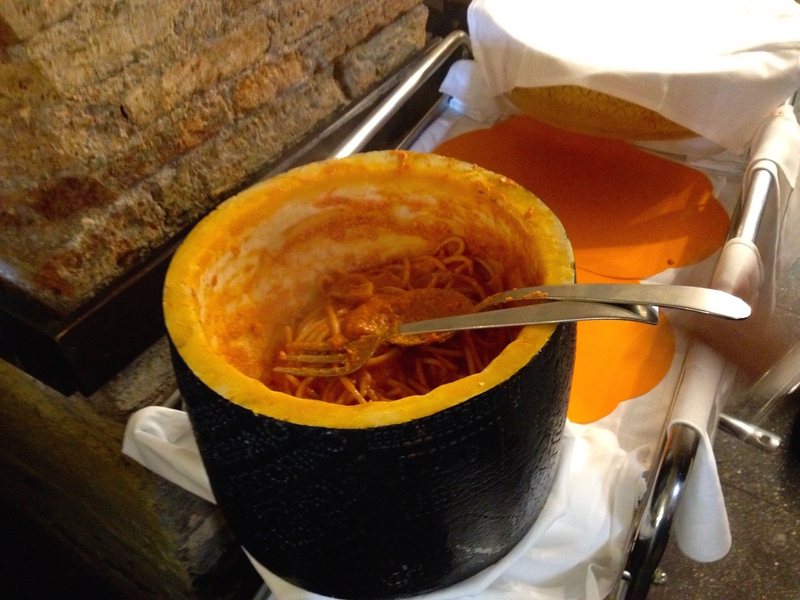 Writing this post has made me want to return to Rome immediately. Have you been to Rome? Did you enjoy the food? Leave us a comment and let us know where we should eat or drink on our next visit! It wouldn’t be very hard to convince me to join you! I think Ron and Tammy will be an easy sell – they still rave about their visit to Orvieto. Glad to hear you enjoyed Rome, too. Hopefully we get to see you sometime this year! It was so fun chatting when we were all in Olympia or Lindsey’s wedding. Hi Melanie! Chanced upon your blog whilst looking for dining recommendations in Rome…do you know if Trattoria Vecchia Roma allows online reservations, or will I have to call? Thanks so much! I’m definitely going to try out a lot of the places you mentioned; they look amazing! Hi there! I know that Trattoria Vecchia Roma doesn’t have an online reservation system on their website, but I did stumble across their email address (vecchiaroma1916@gmail.com)! Maybe you can get creative with Google Translate or hope that the person answering their emails speaks english and can take down your reservation. HAVE FUN in Rome – I’ll have to vicariously get my gelato fix through you.